Posts with tag: "Food styling"
Sometimes a simple, clean images can convey your message better than a complex set. However, simple can be more complex than you think. Beautiful lighting and good composition is a must. This project needed 6 crew and the client. 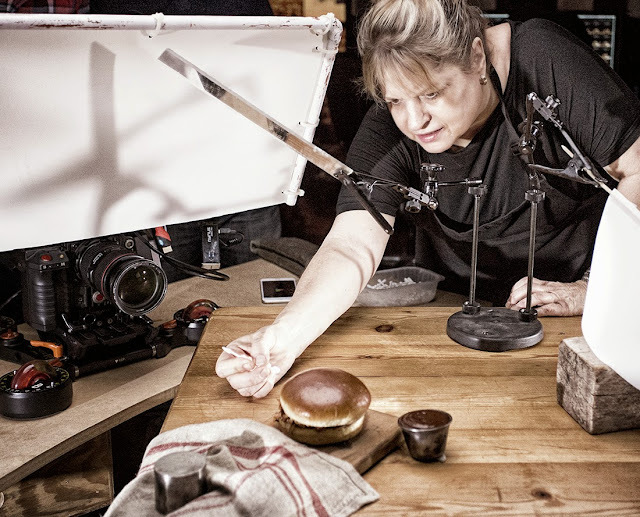 Photographer, photo assistant, production coordinator, retoucher, food stylist and art director. 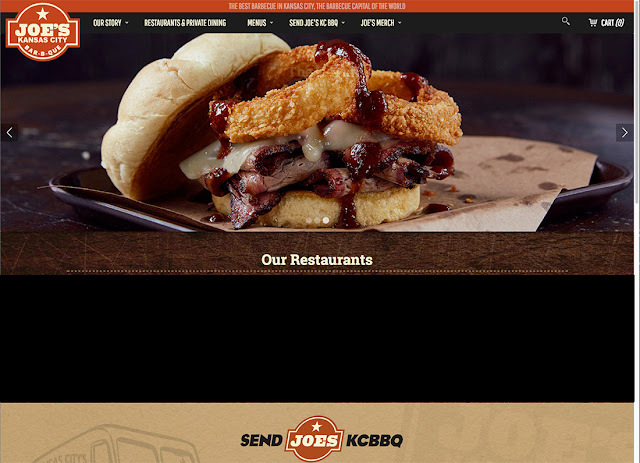 Well, if you're a fan of BBQ anywhere in the world, you've most likely heard of the" World Famous" Joe's Kansas City Bar-B-Que. They've gotten rave reviews from Presidents, sports stars, celebrities, foodies, and of course by yours truly. 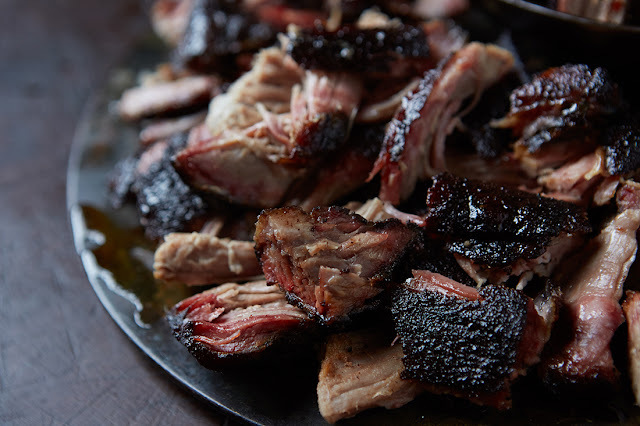 We had the privilege of being asked to shoot their food for the new website. Joe's Kansas City is now selling their world famous Bar-B-Que all over the USA from the website. Now, if you're in Memphis or Seattle and need a great BBQ fix, all you need to do is order it. This was an especially gratifying project since it's a locally owned company and we're big fans! but we don't want our photography to look like all the other companies selling BBQ on the web. 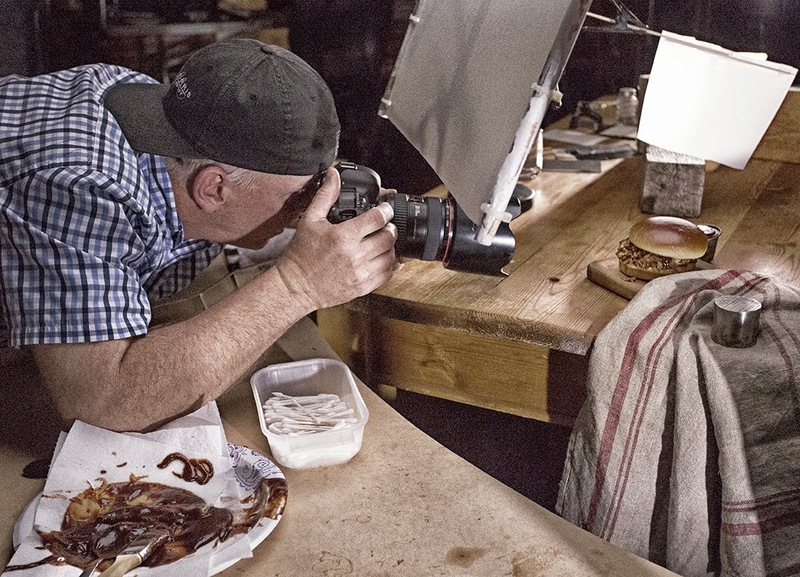 We want the photos to capture the authentic and real look and feel of our product. 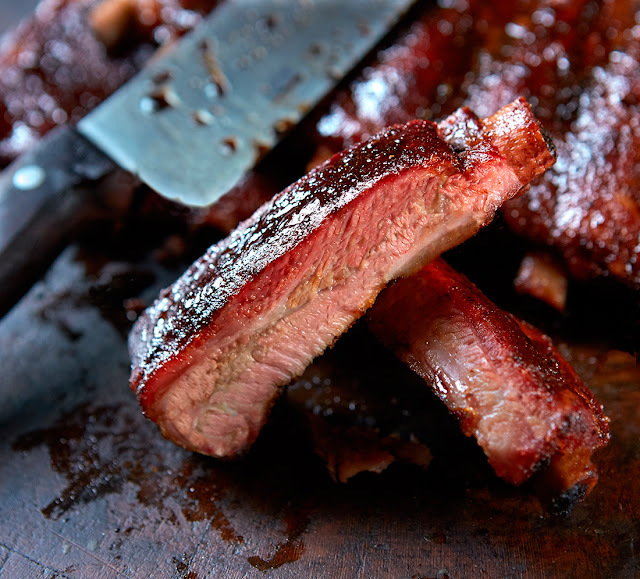 The shots should look as if the pit master just took it out of the hot smoker. We don't want it to look perfect. 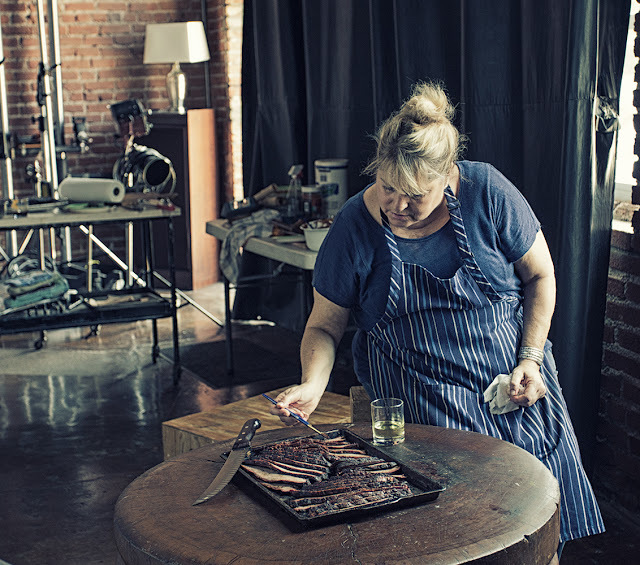 We want it to look authentic with some meat drippings on the surface, the utensils to be a little messy. 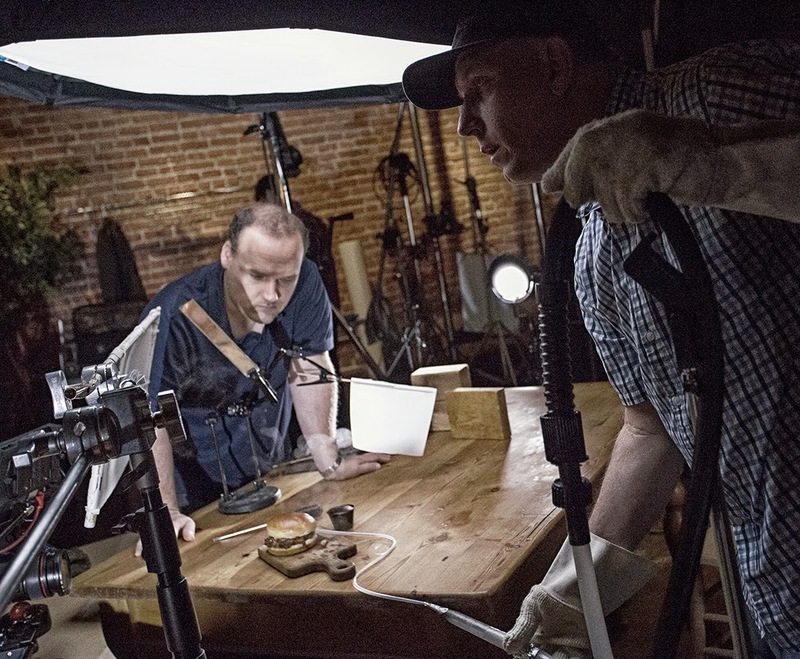 We were fortunate to find a hundred-year-old butcher block table for our background. It is 12"thick and three and a half foot in diameter and made out of one solid walnut log. It set the tone for the whole shoot with its authentic wear and cracked surface. To finish out the authentic and real look, we shot with all natural light and let the shadows go a little dark. 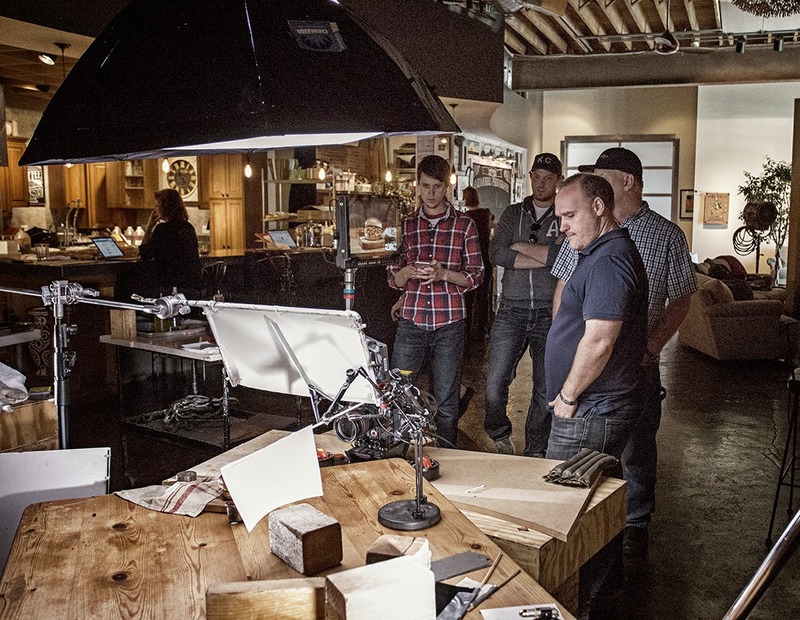 Here are a few fun images from behind the scenes, along with a few of our favorite final shots. 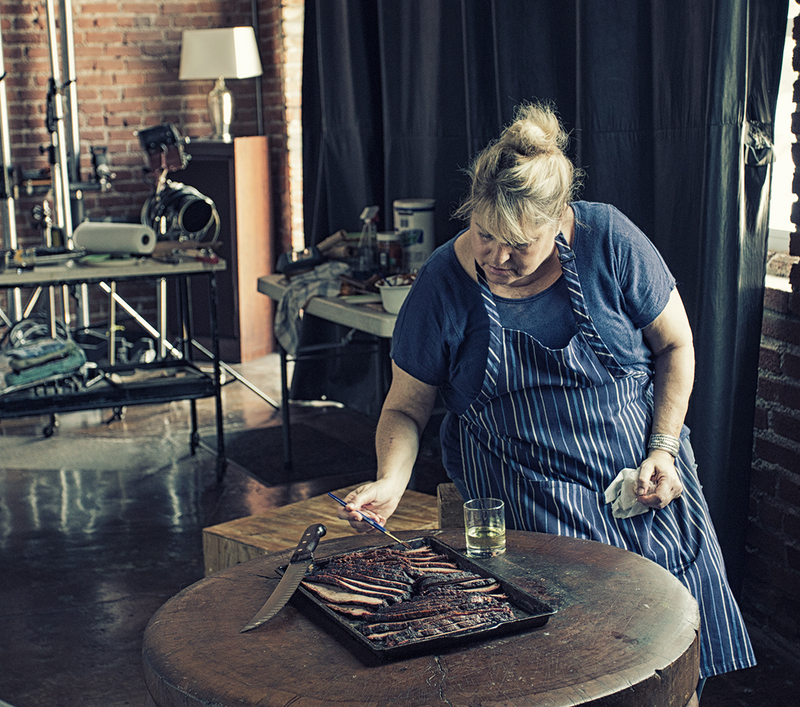 Food Stylist prepping the brisket for it's close-up. David about to get slapped for moving the styled food. 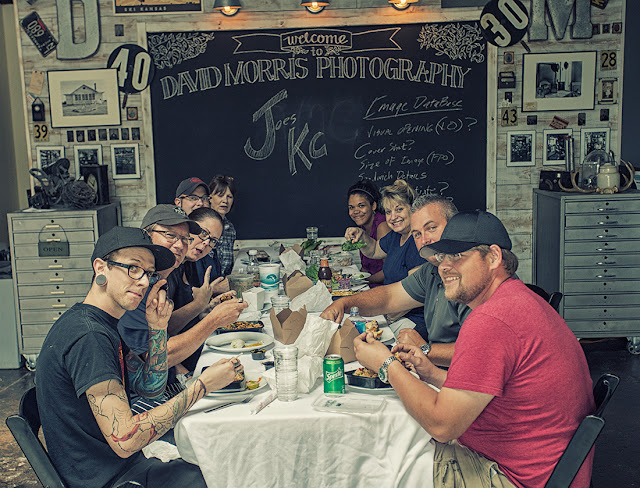 Clients and crew taking a well-deserved lunch break. We recently had the pleasure of shooting for our friends at the Golden Arches again. Over the years, we've shot a number of projects for them and this happened to be the second new product launch we've worked on. 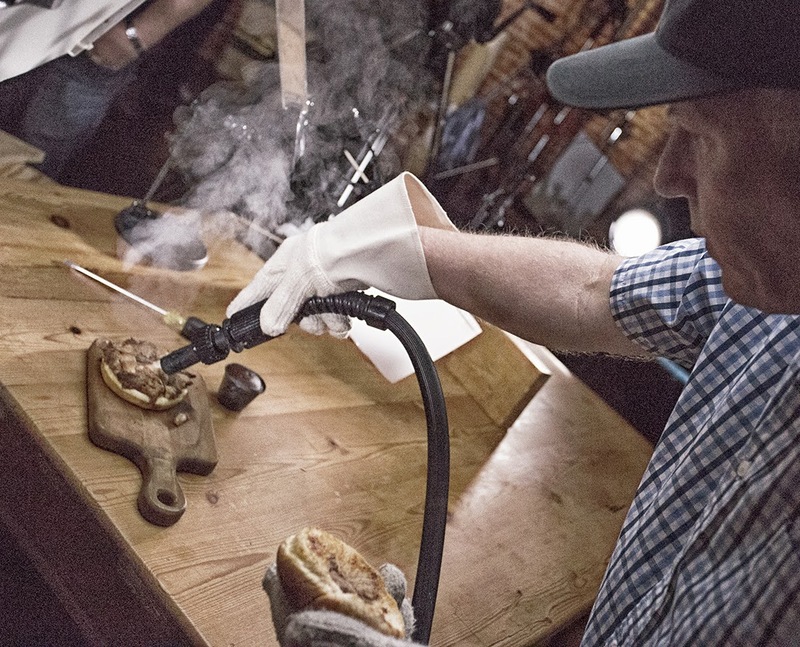 Back in the day, we shot a new sandwich called the jalapeno burger. It was spicy! 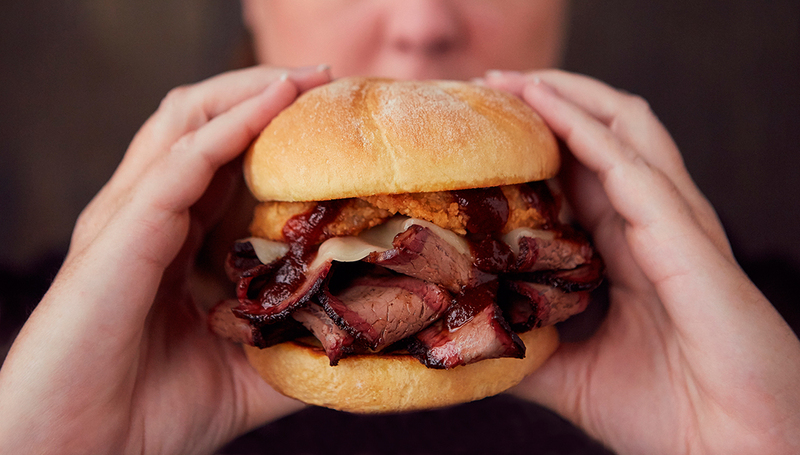 This recent shoot was a little different from what we'd done in the past as we were asked to capture stills and video of the new BBQ Pulled Pork Sandwich. The client also wanted us to create a more relaxed, real environment for this project. 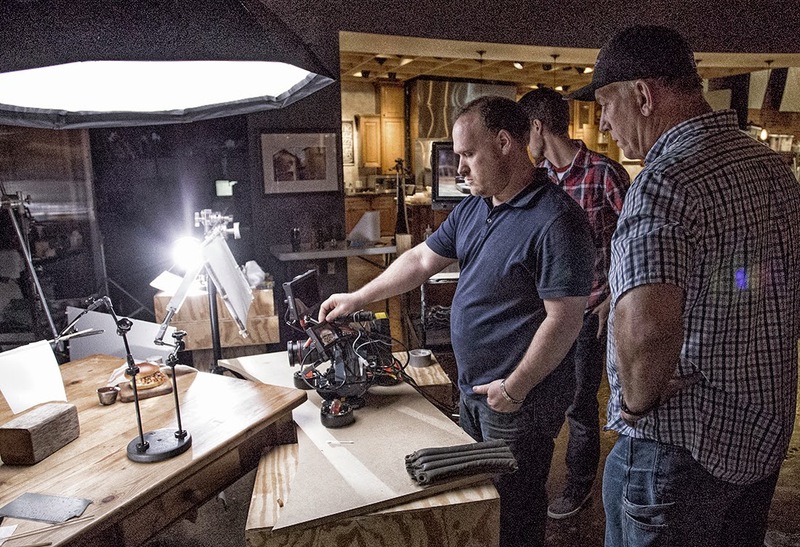 To keep the project streamlined and consistent, David chose to shoot the stills and video with the same lighting. 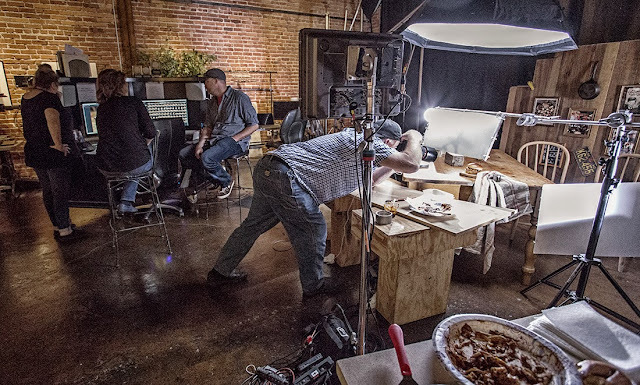 He didn't want to change from strobes to continuous lighting, and we were able to accomplish this by using some brighter lights and a shallow depth of field. In addition to ensuring the lighting was consistent, another challenge we were presented with was to show the product steaming hot in the video. We discussed a variety of ways to do this, but in the end, we just used real steam. The end results – another successful shoot and happy clients. What more could we ask for?!? 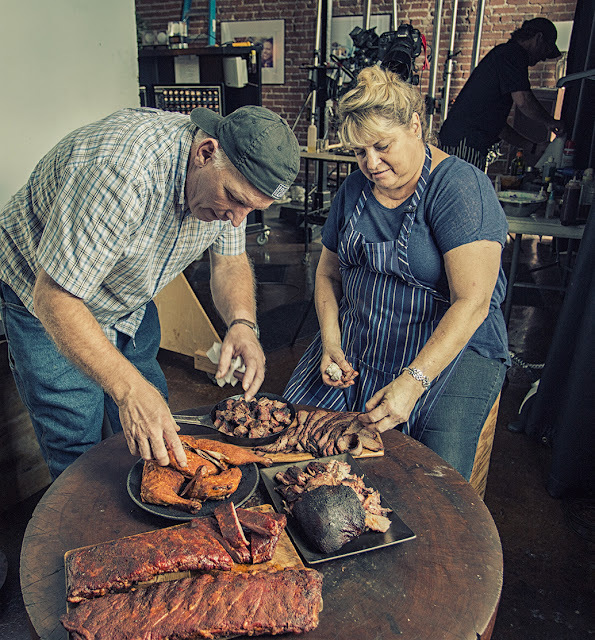 We created a Kansas City looking BBQ joint in the studio! Shooting handheld stills to add to a more "real" feel to the imagery. Piping steam in from the back of the sandwich. Our Food Stylist putting the final touches on the product before we start shooting video. Using our skater to capture nice, smooth moves. 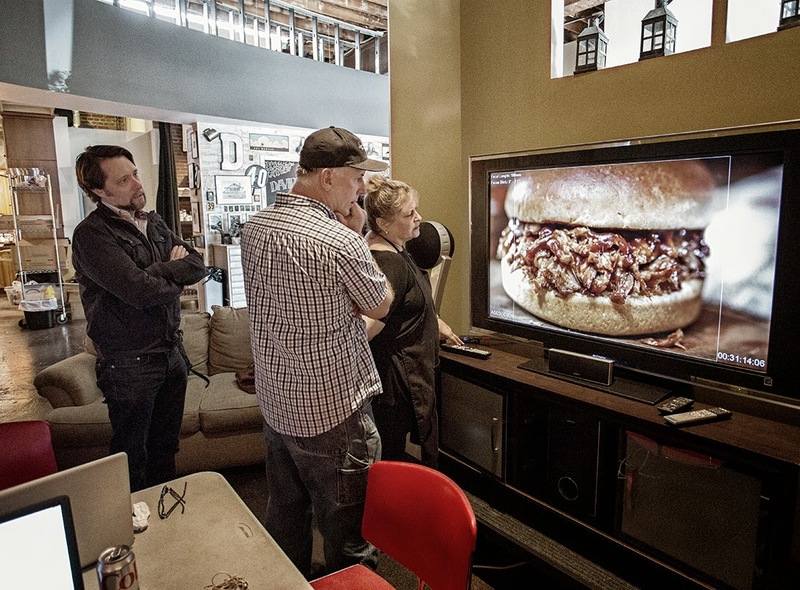 The client, Food Stylist and David examining the details on the large monitor.